While not cuddly to most, bats are shy, skilled flyers that fill an important role in their environments. A new study reveals a deadly disease decimating North American bat populations has stepped up its attack on vulnerable bat populations in the summer months. Pseudogymnoascus destructans, or Pd, is a fungal infection that has already killed millions of hibernating bats in North America. The fungus was formerly thought to attack only during the winter months when bats hibernate in groups in caves. A recent study published by the US Geological Survey reports that the fungal spores of white nose syndrome are now found in summer roosting sites of bats as well. Worse yet, humans appear to be partly responsible for spreading the infection. 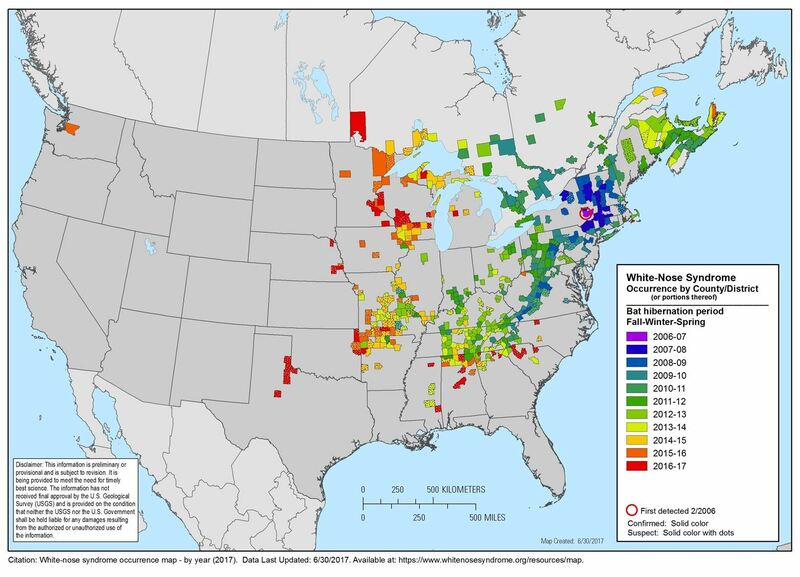 White-nose syndrome (WNS) first appeared in the US in about 2006. The fungal disease is thought to have been introduced to the US from Europe, very likely on the clothing, gear, and boots of European visitors when they visited American caves. The infection was discovered in this country in upstate New York, in a cave adjacent to a commercial cave that hosted as many as 200,000 people per year. While cave bats in Europe and China are adapted to and unaffected by the fungus, American bats have very few defenses against the infection. Don't Miss: Bats & Viruses — Friend or Foe? The fungal infection is now present in nine species of bats as they hibernate together in the winter. About 45 species of bats in this country hibernate, meaning many more species could be infected. The fungus passes between bats as they hibernate, ingesting the skin of their wings as they sleep. Becoming restless, the bats awaken during hibernation, exhausting their energy reserves, and suffering from the resulting chemical imbalances and destruction of their wing tissue. The syndrome gets its name from the characteristic fuzzy fungal growth around the muzzle of doomed bats. Without extreme measures, there's no stopping WNS, as it's spread to 31 states and five Canadian provinces. In 2016, authorities in Washington state diagnosed a dying bat with the disease, a location that was 1,300 miles from the nearest known outbreak. The US Fish and Wildlife Service estimates 6.7 million bats had died by 2012 — just six years since the infection invaded this country. Now, the disease now appears to cause infection throughout the year, instead of just the winter. The new report from the US Geological Survey does not offer any good news for vulnerable bats. Researchers trying to understand the spread of the spores collected samples during July and August of 2012. 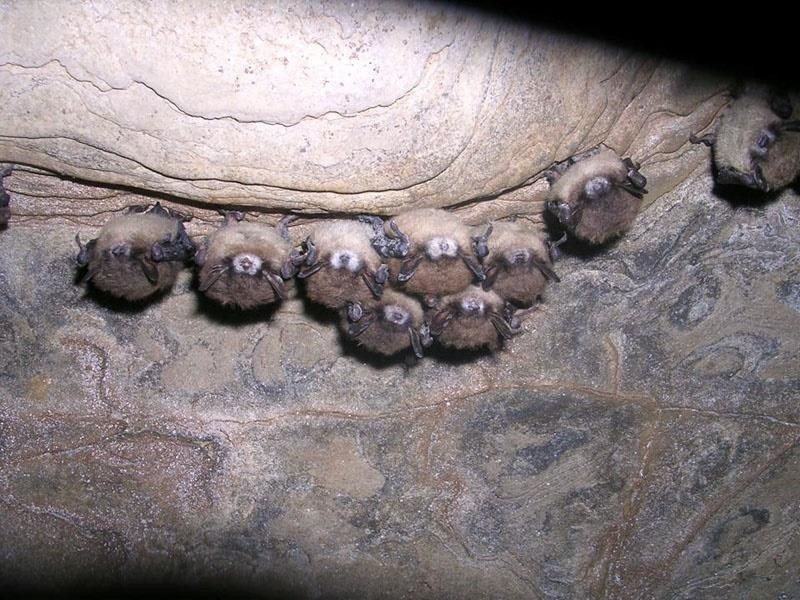 Sites visited by the scientists included six roosting sites known to offer winter shelter to bats contaminated with Pd, and two uncontaminated sites. This summertime study offered a glimpse of whether the fungi is spreading during summer months — turns out that it is. Researchers detected Pd on the wing-skin or guano (bat poop) from 40 of 617 bats of five different species in caves where they'd found white-nose syndrome before. Pd was found on cave walls, but also in the floor sediment of the five contaminated sites — and one of the sites previously thought uncontaminated. They also detected Pd on the bat-trapping equipment and other gear of research scientists. Despite the presence of the spores, researchers did not detect visible damage on the wing-skin of infected bats during their summer research. That doesn't mean the spread couldn't affect the bats when they go to hibernate in the winter though. Because Pd now persists in these sites throughout the year, humans may be giving the spores not just a lift to the next cave over, but "across the landscape...[to] establish environmental reservoirs in previously unexposed hibernacula (or roosting sites)." The research suggests that we need stronger strategies to protect uninfected caves and sites until we know more about what options could exist to protect uninfected bat communities in the western US. The northern long-eared bat is now on the endangered species list due to the numbers lost from white-nose syndrome. Check maps to find out where WNS is suspected. Even if you have decontaminated your gear, don't go from a contaminated site to a site where researchers haven't found the infection. When you leave a cave, leave dirt and debris behind, scrape your boots, bag your gear, boots, and clothes, to avoid transmitting spores to your car and beyond. Wash hands, gear, and any footwear or gear that touched the ground with hot water and soap. Know and use decontamination practices. With no good news on the horizon, or in the caves, bats and bat species remain under attack from this virulent fungal infection. Spread the word about the importance of saving the bats — and if you are a hiker, climber, or caver make sure not to spread the spores. News: Bats & Viruses — Friend or Foe?